Subject to the WEP? Your Social Security Statement Is Probably Wrong! Social Security retirement benefits often make up a large portion of an individual’s retirement income. Throughout your lifetime, you can keep an eye on your projected retirement benefits on your annual Social Security statement or by looking at your online mySocialSecurity account (mySSA). It’s a great tool for making educated retirement planning decisions. But what if your Social Security benefit’s estimate is incorrect by several hundred dollars per month? For some people, it is wrong. Even worse, they probably don’t know it is wrong. What an awful retirement surprise! Janice worked as an engineer for 11 years before switching careers to education. She was a detailed planner and had a carefully thought-out retirement plan from an early age. She set a monthly retirement spending goal and subtracted the amount she would receive from her teacher’s retirement and Social Security. The amount left would have to be made up with savings. For the next 20 years, she diligently worked her retirement plan. A few years before retirement, she came to me for a second opinion of her plan. Everything looked great until I saw what she was estimating from her Social Security. All her calculations were based upon the incorrect amount of Social Security income. Instead, I immediately knew that her actual benefit would be about $400 lower per month. The worst part is that she had taken her estimate directly from her Social Security statement! Janice’s mistake was easy to make, and pretty common. As part of her annual retirement plan update, she would go to her mySSA account and check her benefit estimate. Since she was no longer contributing to Social Security she knew that the only increases would be from the cost of living adjustment. So, why can’t the Social Security Administration accurately estimate your benefit amount when you have a non-covered pension? The SSA doesn’t know about your non-covered pension, so they use the normal calculation method to estimate your benefit. When you file, and they find out about the pension, they’ll recalculate your benefit with a different formula. The result will be a lower benefit amount than what you see on your benefits estimate. Don’t make this same mistake! There is a way to estimate what your benefit will be AFTER the reduction for the Windfall Elimination Provision. Video: Social Security for Educators (and other public servants). This gives a broad overview of the Windfall Elimination Provision and the Government Pension Offset. 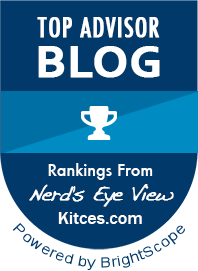 After watching that, I’d move on to my two articles The Best Explanation of the Windfall Elimination Provision and What You Need To Know About The Government Pension Offset. 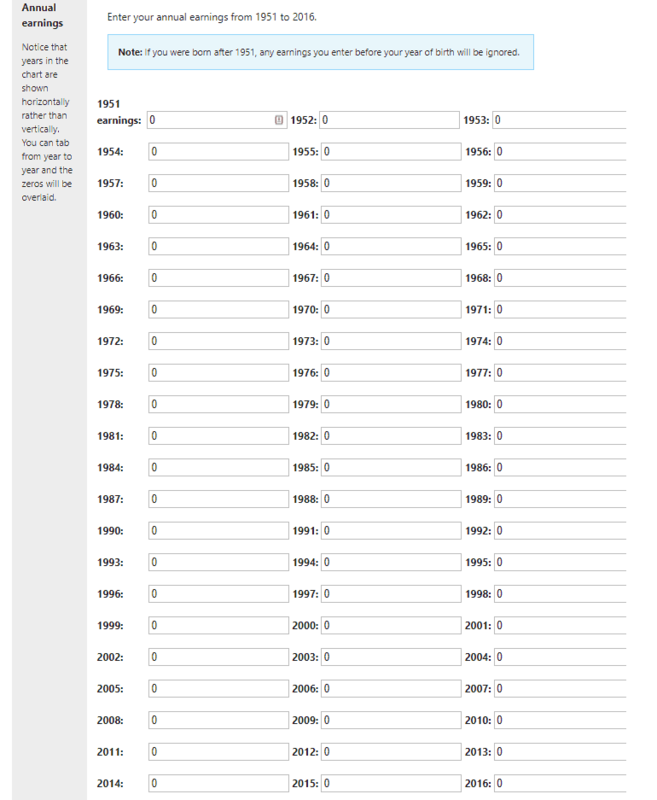 The WEP Calculator is one of the best-kept secrets on the 110,000 page Social Security website. You can find it, along with 10 other calculators, on their calculators page. You put in a few pieces of information, and receive an accurate estimate of your SS benefits after the WEP reduction is factored in. The easiest way to get there is to visit the direct page. However, if you want to see the other calculators that are available, you can go to the main benefit calculators page. This calculator does not require you to enter several pages of data to get your calculation results. The only thing you need is your date of birth, proposed age at retirement, earnings information (historical and future) and pension amount. We’ll go through each step to make sure it makes sense. The “Date of birth” section is self explanatory. However, the “age at retirement” is important. This should be the age at which you plan to file for Social Security benefits which is not necessarily the age at which you plan to stop working. The SSA loves to make the assumption that you will file for benefits at the same time you stop working. For an individual with a well thought-out retirement plan, that is not always the case. Your estimated future benefit amount can be expressed in “today’s dollar” or “future dollars.” If you select “today’s dollars” you will not have any increases applied to your benefit amount to account for inflation. If you select “future dollars” the calculator will increase your benefit by a designated amount every year. When selecting the inflation option, I strongly suggest using the “today’s dollars” option. If you use the “future dollars” option, it will assume your benefit will increase by 2.6% per year from now until you file for benefits (according to the SSA WEBSITE). That’s simply too high! I would use “today’s dollars” and then apply an inflation rate of 1.5% using a calculator like you can find at Bankrate.com. The linked calculator is actually a compound interest calculator, but it will do the trick nicely. Just leave out any annual contributions and it will tell you exactly what you need to know. The amount of your pension from your non-covered work can be estimated. In most cases, your pension paying agency can help you estimate your pension amount based on a few projections. The reason this is important for this calculation is due to the ‘WEP Guarantee’ rule. This rule says that your reduction to SS benefits from the WEP can never be greater than an amount equal to 1/2 of your pension. So, if your pension is $600, the WEP reduction can never be more than $300. This rule only affects a small number of individuals since the maximum reduction that can be applied is $428 (for 2017) no matter how much your pension is. Now just put in your historical annual earnings information from your Social Security statement. You should only plug in earnings that you are going to pay Social Security tax on. If you are not going to pay Social Security taxes, leave a zero in both of the boxes. 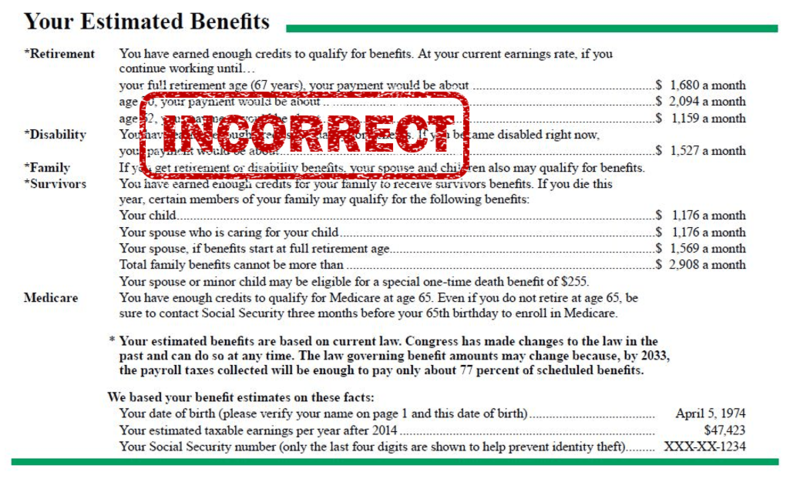 This is the section that allows you to test how different scenarios will affect your Social Security benefit. For example, if you are considering a job leaving your non-covered job and taking a job that pays into SS, you can put the future earnings in to measure your Social Security benefit increase vs. your potential decrease in pension payments. The one downside to this calculator is that it doesn’t allow you to input variable earnings for future years. If you want to do that, you’ll need to download the Detailed Calculator. Fair warning though, the detailed calculator is a lot more complicated to use than the online calculators. You’ll have to refer to the help section to understand the steps. Woo hoo! That glorious moment has arrived. It’s time to hit the ‘Calculate Benefit’ button and check your results. Now that you’ve calculated the results, you’ll see two main sections. The first section will list your eligibility for the various benefits and the second section will list the projection of the dollar value of your benefits. The “benefit eligibility” shouldn’t cause any confusion. It will say either “Insured” or “Not Insured” in each of the different benefit boxes. What yours will say is dependent on your work history and whether or not you’ve earned enough Social Security credits in each of the benefit types. Interestingly enough, all three of these benefit types have different entitlement requirements. For more information, read my article titled The 4 Types of Social Security Credits. Under the benefits estimates section you’ll see a few different benefit amounts listed. Monthly retirement benefit: This is simply the amount of benefit you’ll be entitled to at the age you indicated in the “age at retirement” section. Monthly disability benefit: This should be really close to your full retirement age benefit amount and is the amount you should receive if you become disabled before you retire. Your surviving child: If you die, your surviving child(ren) are eligible for a benefit of up to 75% of your full retirement age benefit. Your surviving spouse caring for your child: If you die and have children of a certain age at home, your spouse is entitled to a benefit equal to 100% of your full retirement age benefit. This is known as the child-in-care benefit. Your surviving spouse at full retirement age: Your surviving spouse will be eligible for 100% of your full retirement age benefit at his/her full retirement age. However, they can file as early as age 60 and receive reduced benefits. Maximum of total family benefits: In no case will the total amount of benefits paid exceed 180% of your full retirement age benefit. In fact, the range is 150-180% depending on your retirement benefit. 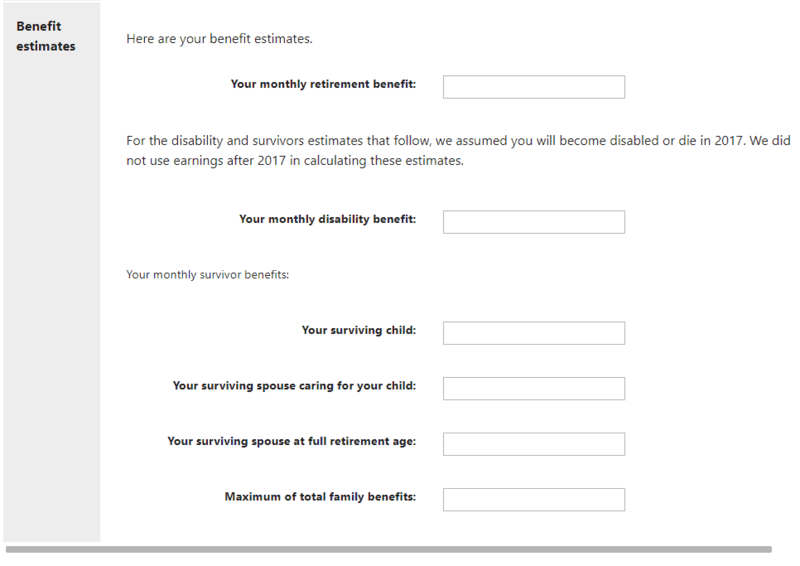 If you have a pension from a job that doesn’t also contribute to the Social Security program, you’ll see that this calculator gives you different results from the simple estimation of benefits available from Social Security. This amount may be tiny, or more substantial, but it is important either way. Correct information, learned by doing the steps listed above, will give you the right math for your retirement planning, and may result in a better quality of life in retirement. There is a lot to know about benefits for children and spouses. For example, there are benefits available to your children and spouse if you become disabled. I’ve written an article which covers this titled Why Social Security is Important for YOU (even if you’re not close to retirement). It has charts that will show you have to calculate the family benefit maximum and other useful tools. Be sure to check it out whenever you’re working on your family’s financial plan. 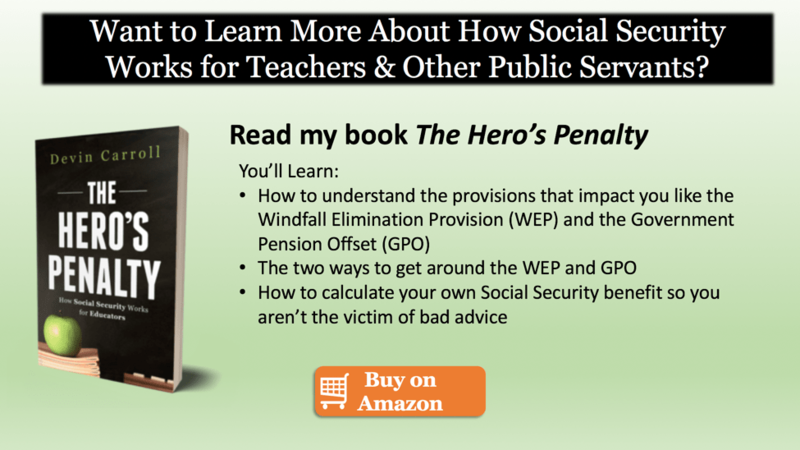 "Most of the Social Security questions I receive can be answered in this easy-to-read book."